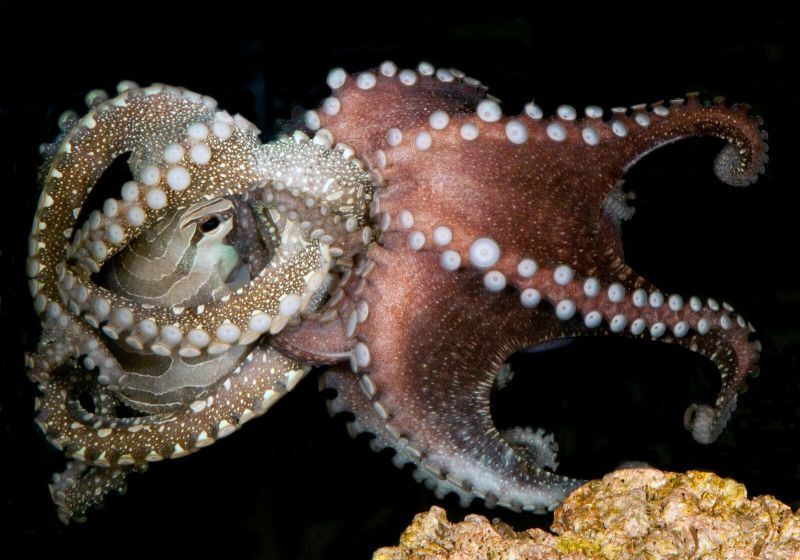 Octopuses are notoriously anti-social—if you put more than one in a tank, they'll attack each other. And they certainly don't form family ties—females are prone to eating males after mating, and they usually die when their eggs hatch. However, in a recent study from UC Berkeley and the California Academy of Sciences, a mud-dwelling "harlequin octopus" defies all such stereotypes. As reported August 12 in the journal PLoS ONE, members of this species—the larger Pacific striped octopus--will happily cohabit with their partners, share food and watch their eggs hatch for months on end. The roots of this paradigm-altering discovery reach back forty years and down 5,000 miles of coastline, to the Smithsonian Tropical Research Institute in Panama. Roy Caldwell, professor of biology at UC Berkeley and first author of the octopus study, was on sabbatical in Panama when he met biologist Arcadio Rodaniche. While Caldwell was hunting for the colorful shrimp that are his primary research interest, he says, "I caught three or four little striped octopuses; they came out of the rocks. Arcadio told me they were chierchiae." Octopus chierchiae is a tiny species, about the size of a quarter, sometimes called the lesser Pacific striped octopus. That's in comparison to the larger Pacific striped octopus, which is baseball-sized, and so poorly known it doesn't have an official scientific name. Both lesser and larger species are called “harlequin octopuses” because of the dramatic stripes and spots they often display, which are unique to individuals—like fingerprints. And both species, it seems, have never heard that laying eggs is supposed to be fatal for octopuses. "I brought [the lesser Pacific striped octopuses] back to Berkeley because I thought they'd be neat to photograph," says Caldwell, who is skilled behind the lens. Meanwhile, Rodaniche was making even more extraordinary discoveries about O. chierchiae's bigger cousins. In addition to laying eggs for an extended time, mating pairs of larger Pacific striped octopuses sometimes shared a single den. Perhaps strangest of all, they mated beak-to-beak—an incredibly risky position if either partner is concerned about post-coital cannibalism. Males of other octopus species take more sensible precautions, either handing over sperm at arm's length or mounting the female from behind. Rodaniche's observations of the larger octopus, and to an extent Caldwell's of the lesser, could have overturned years of octopus dogma. But neither set was published. Caldwell says he "was too naive" to realize how unusual it was. Rodaniche, a specialist on squid and octopus, did submit a scientific paper—but the journal rejected it. In 2012, Caldwell and co-author Richard Ross of the Steinhart Aquarium had been working with O. chierchiae, the lesser Pacific striped octopus, when the collector who was supplying them unexpectedly sent a much bigger specimen. It was, of course, a larger Pacific striped octopus—which no scientist had seen or studied for decades. "It felt like suddenly we got Bigfoot in the lab," says Ross. "And then it was a race to make sure we got all the specimens." The passage of time had not changed this species' mating preference. Couples still joined beak-to-beak, as Rodaniche had observed. One mating pair cohabited for days in the same den, and even shared food—also beak-to-beak, like the famous spaghetti kiss from Lady and the Tramp. Further verifying Rodaniche's original report, the females laid eggs for months on end, long after the first-laid eggs began to hatch. And unlike other octopus species, in which mothers stop eating to care for their eggs, these females continued to eat—and mate. Why Is This Octopus Such an Oddball? Caldwell thinks most of the larger Pacific striped octopus's unusual behavior stems from the females' extended spawning period. "She couldn't possibly go that long without eating," he says. "And she probably has to replenish her sperm supply, too." Mating beak-to-beak allows a female to keep an eye on the eggs she's already laid while collecting new sperm. Sharing dens and food could also make it easier for her to multi-task. 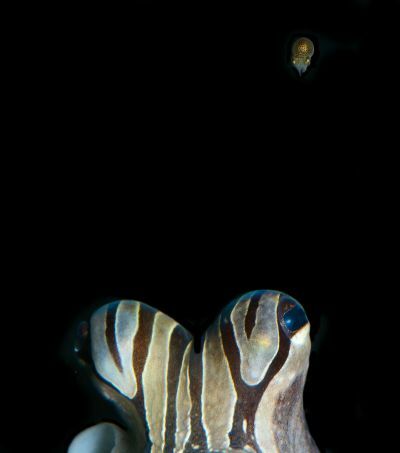 Furthermore, their unique body patterns may allow larger Pacific striped octopuses to recognize each other, an ability that could minimize aggression. 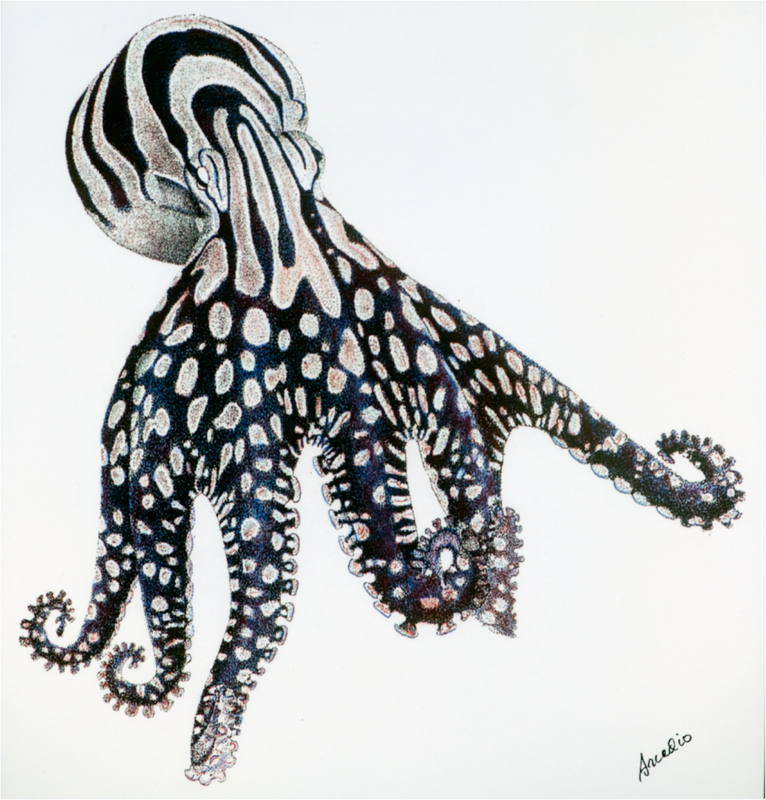 But O. chierchiae, the lesser Pacific striped octopus, has unique patterns too, as well as an extended spawning period. Yet its behavior is more typically anti-social. "I'm much more scared putting the chierchiae together," says Ross. He suggests that the differences between the two species may be due to their different habitats. O. chierchiae lives in rocky tidepools, a constantly changing environment which could make it difficult to build relationships. The larger Pacific striped octopus lives deeper, on muddy seafloors. This relatively stable habitat might be better suited to the evolution of gregarious behavior. "We don't know yet if they're truly social," cautions co-author Christine Huffard of the Monterey Bay Aquarium Research Institute. But the possibility exists. "The type of behaviors we've seen, like food sharing and den sharing, that's just in the laboratory. We'd probably see much more complex behaviors in the wild."